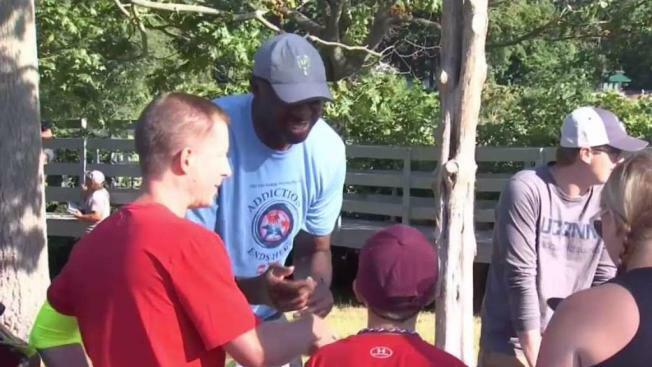 On Saturday, Old Saybrook native and former NBA all-star Vin Baker returned home to help those battling drug and alcohol addiction. On Saturday, Old Saybrook native and former NBA all-star Vin Baker returned home to help those battling drug and alcohol addiction. It’s a problem Baker has dealt with personally. “Everything I worked so hard for was ravaged by alcoholism and addiction,” said Baker. He shared his story of bouncing back in the hopes of inspiring others. Baker hosted his first ever road race to raise money and awareness about substance abuse. Before the race had even begun, $120,000 was raised for the Vin Baker Foundation’s Addiction Ends Here 5K. The Vin Baker Foundation aims to open sober housing in Connecticut. Baker said beyond the money, he wants to inspire hope. “No matter how you’ve fallen. No matter where you are in addiction, you can overcome it. If I can overcome it, I want to provide hope that everyone can overcome it,” Baker said. “Addiction is just taking over our country and it’s just so sad,” said Karen Murray, one of the participants. Pictures of the lives lost to drug addiction were lined up near the start and finish line to represent the crisis in Connecticut. “Three people are dying a day in Connecticut from the opioid epidemic,” said Andy Buccaro, the director of Project Courage, which partnered with the Vin Baker Foundation. Two-hundred-fifty runners laced up to save lives. “It’s a great donation to give and it gives a lot of awareness to the problems that are in the state,” said Laura Zadrick, Bristol. Some say they were inspired by Baker’s story. “He stepped up to the plate and he did what he had to do to get through his addiction and coming out the other end and where he is today with everything he’s done, he’s giving back,” said Ron Stewart, Guilford. After a career cut short by addiction, Baker hopes to turn the course of others’ substance abuse, by adding his face to the fight. “Things that overcame me and took so much away from me I don’t want to see it happen to other people,” said Baker.